Hong Kong: Arts of Asia, 1990-1999. 4to. 37 issues over a 10 year period. No complete years. With label on front cover:BO56/Back Issues $8.00. Hong Kong: Arts of Asia, 1973-1988. 4to. 32 issues over a 15 year period. No complete years. With label on front cover:BO56/Back Issues$8.00. Hong Kong: Arts of Asia, 2000-2003. 4to. 16 issues over a 3 year period. No complete years. With label on front cover:BO56/Back Issues $8.00. Kowloon, Hong Kong: Arts of Asia Publications, 1989. First edition (presumed; no earlier dates stated). Paperback. Barely worn spine head, gently rubbed corners, else very good+.. Blue multicolored folio (white spine); 156 p, b&w illus (some color) ; 31 cm. Arts; Asia. Condition: Barely worn spine head, gently rubbed corners, else very good+. 16B. Fine. 1984. Magazine. This specific magazine is in fine condition. The edges and corners free from significant bumps or scuffing. The pages are clean, crisp, unmarked and uncreased with no highlighting, notes or underlining. This is a remarkable magazine and is in fine condition. ; This issue features The Cricket Story, Arts of the Islamic Book, Sacred Heirlooms, Metalwork of the Shanghai Bund, Kampong Pastimes, and more~! ; 0 x 0 x 0 Inches; 144 pages . Hong Kong : Arts of Asia Publications, 1994. Soft cover. Very Good+. Oversized softcover; ; 8vo 8" - 9" tall; 27536 Professional bookseller for twenty years. Orders shipped daily in cardboard bookfolds. Arts of Asia, 2002. Paperback. Very Good. Unmarked. Beautifully illustrated. 141p. Features Singapore's Asian Civilisations Museum. Hong Kong: Arts of Asia Publications, 1998. 6/21/2010. Fine. First edition. Quarto wrappers. 148pp. Fine. The Royal Palace of Cambodia, Daily Buddha Images of Thailand, Old Champa Kiln Sites and Wares: Binh Dinh, Vietnam, Devil Dance Masks of Sri Lanka. Kowloon, Hong Kong: Arts of Asia Pub, 1980. Japanese decorative arts magazine in excellent condition, no marks or writing, binding tight spine perfect, illustrations bright and clean. Immediate shipping w/tracking included.. Soft Cover. Fine. 4to - over 9¾" - 12" tall. Hong Kong: Arts of Asia, 1982. Interior clean. Edgewear to wraps. Included are articles and photos of Bandha textiles, Burmese wall hangings, Mien needlework, Lao Neua weavings and more. . Soft Cover. Good. Arts of Asia, 2006. Paperback. Very Good. Unmarked. Lavishly illustrated. Features "Towards the Dragon and the Mytical Bird--tracing antecedents of Khitan iconography" and "Wing Palace Head Ornaments-worn by court Ladies. 157p. Arts of Asia, 1977. Paperback. Very Good. Unmarked. Lavishly illustrated. Features Chinese Taoist Art. Also Portuguese Porcelain trade with China, Ivory Carvings of the Ch'ien Emperor and more. 104p. Hong Kong: Nguyet Tuyet, 2003 140 pages. This book is in excellent condition.. Paperback. Excellent. Size H: 11"-12" Tall (279-304mm). Arts of Asia, 1982. Paperback. Very Good. Unmarked. Some creases on cover. Beautifully illustrated. 152p. Features Malaysia, Prehistoric Collections in Muzium Negara, Kuala Lumpur. Contributors include Fong Peno-Khuan, Othman Bin Mohd Yatim, Adi Haji Taha, Kieth Addison, and more. Arts of Asia Publications, 1985-01-01. Paperback. Good. .
Arts of Asia Publications, 1985-01-01. Paperback. VeryGood. .
Arts of Asia, 1986. Paperback. Very Good. Unmarked. Beautifully illustrated. 156p. Features the British Museum. Contributors include Lawrence Smith, Anne Farber, Jessica Rawson, Robert Knox, J. M. Rogers, Rachel Ward, Victor Harris, and others. Arts of Asia, 1981. Paperback. Very Good. Unmarked. Bumped corner. Lavishly illustrated. Includes Chinese Firework Labels, Yao Taoist Paintings, Buddha Images from Burma (Part I), Chinese Miniature Silver Deities, the folk murals of Shekhawati and more. Also includes a loose letter from the editor about the publication. Arts of Asia Publications, Ltd. Used - Like New. Periodical / Magazine. . Like new; no internal markings; has only lost its Brand New shine. No pricing stickers. No remainder mark. Stored in sealed plastic protection. In the event of a problem we guarantee full refund. 1984. Periodical / Magazine. Arts of Asia Publications. Used - Good. Former Library book. Shows some signs of wear, and may have some markings on the inside. Hong Kong : Arts of Asia Publica, 1991-01-01. Journal. Good. .
Arts of Asia, 2003. Paperback. Very Good. Unmarked. Beautifully illustrated. 136p. Features the New Asian Art Museum in San Francisco, the Hong King Museum of Art Chinese Jade and Gold, and the Islamic Arts Museum Malaysia (IAMM). Contributors include Forest McGill, Thomas Christensen, Rose Wing Chong Lee, and others. Includes a brochure from the museum on the collection highlights. Tuyet Nguyet. PAPERBACK. Glossy soft cover has small tear on bottom left corner of front cover and bent on corners. Inside 'very good', 87 clean pages although some of them are bent at lower corner. . Good. Arts of Asia Publications, 1986. very good copy, previous Art Library copy with library mark Publisher: Arts of Asia Publications, Hong Kong, 1986 23 x 30 cm. ; pg. 144; Special Japanese Issue. Articles include: Japanese potter: Kenji Funaki / Sir Hugh Cortazzi - Antique Japanese festival dolls / Timothy M. Mertel - The appreciation of Zen art / John Stevens - Treasures from the Christian century / W. H. Tilley - Japanese cloisonne: Its craftsmanship and artistry / Gerd Lester - The Museum Georges Labit / Beowulf K. Klebert - Collectors column: From earth and sea: The hidden history of Thailand / Linda E. Villiers FREE TRACKING and DELIVERY CONFIRMATION. Soft Cover. Very Good. Folio - over 12" - 15" tall. Hong Kong: Arts of Asia Publications, 1984. Paper bound, large quarto, volume 14, no. 6 only (November-December 1984), 144pp. Corners moderately bumped and lightly rubbed else very good. 550 grams. Scan available on request. All books in stock and available for immediate shipment from Winnipeg, Manitoba. Arts of Asia: Vol. 12 No. 6. Bangkok Bicentennial Issue. November-December 1982. Arts of Asia Pub.. Very Good. 1982. Paperback. 160 pages . Hong Kong: Arts of Asia Publications, 2006. Softcover. Quarto: VG/no-Dj paperback: White spine with black text: Covers are clean with light shelfwear, binding solid: Textblock is clean: Book is a periodical, this issue focuses on the Freer & Sackler galleries in Washington, DC: 158 pp. Shelved Rockville Bookstore. Arts of Asia Publications, Ltd. Used - Very Good. Periodical / Magazine. . Near Fine condition; edges, corners, and covers of book show very minor wear. No underlining; no highlighting; no internal markings. No pricing stickers. No remainder mark. Stored in sealed plastic protection. In the event of a problem we guarantee full refund. 1981. Periodical / Magazine. Arts of Asia Publications, Ltd. Used - Very Good. Periodical / Magazine. . Near Fine condition; edges, corners, and covers of book show very minor wear. No underlining; no highlighting; no internal markings. No pricing stickers. No remainder mark. Stored in sealed plastic protection. In the event of a problem we guarantee full refund. 1983. Periodical / Magazine. Arts of Asia Publications, Ltd. Used - Very Good. Periodical / Magazine. . Near Fine condition; edges, corners, and covers of book show very minor wear. No underlining; no highlighting; no internal markings. No pricing stickers. No remainder mark. Stored in sealed plastic protection. In the event of a problem we guarantee full refund. 1985. Periodical / Magazine. Arts of Asia Publications, Ltd. Used - Very Good. Periodical / Magazine. . Near Fine condition; edges, corners, and covers of book show very minor wear. No underlining; no highlighting; no internal markings. No pricing stickers. No remainder mark. Stored in sealed plastic protection. In the event of a problem we guarantee full refund. 1986. Periodical / Magazine. Hong Kong: Arts of Asia Publications, 1981. Wraps have light edgewear. Pages are clean, text has no markings, binding is sound. . Soft Cover. Good. 4to - over 9¾" - 12" tall. Periodical. Hong Kong: Arts of Asia Publications, 1980 Featuring "Primitive Art in Indonesia." Hong Kong: Arts of Asia Publications, 1980 Featuring "Kingfisher Feather Jewellry." Hong Kong: Arts of Asia Publications, 1987 Featuring "Adaptation and Mimicry in Trade Ceramics." Hong Kong: Arts of Asia Publications, 1980 Featuring "Religion and Art." Hong Kong: Arts of Asia Publications, 1987 Featuring "Costumes and Weavings." Hong Kong: Arts of Asia Publications, 1988 Featuring "The Dragon in Chinese Art: The Year of the Dragon." Hong Kong: Arts of Asia Publications, 1986 Featuring "Mountain Retreats in Jade." Hong Kong: Arts of Asia Publications, 1977 Featuring "Woodblock Prints from Fatshan". Hong Kong: Arts of Asia Publications, 1986 Featuring "The British Museum Department of Oriental Antiquities." Hong Kong: Arts of Asia Publications, 1985 Featuring "Special Chinese Issue." 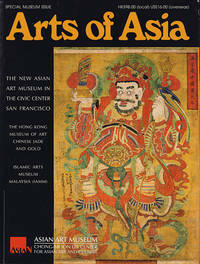 Hong Kong: Arts of Asia Publications, 1987 Featuring "Arts from Islamic Cultures: Los Angeles County Museum of Art." Hong Kong: Arts of Asia Publications, 1979 Featuring "Chinese and Buddhist Art in the Royal Ontario Museum." Hong Kong: Arts of Asia Publications, 1988 Featuring "The Charlotte C. and John C. Weber Galleries for the Arts of Ancient China at the Metropolitan Museum: A Preview." Hong Kong: Arts of Asia Publications, 1980 Featuring "The Watch Market in China." Hong Kong: Arts of Asia Publications, 1984 Featuring "Light of Asia."